Music can recall memories, inspire action, soothe fevered minds and… summon robots? 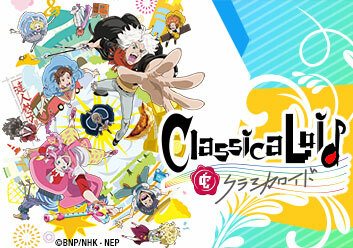 For the remixed classical maestros, or "classicaloids", a unique "musik" is their sword and shield with explosive notes that do way more than rouse emotions. Motz and Beet-san, who claim the names of timeless composers Mozart and Beethoven, are only the overture to the wacky concerto ready to awaken an unsuspecting modern town. What could go wrong? Kanae is stuck with two strange squatters in her home, Motz and Beet-san. When a demolition crew arrives to tear down her house, Beet-san unleashes his musical rage. Sosuke’s plans for Kanae’s birthday involve Musik, and there’s a problem: neither of the classicaloids know how it happens. The stage is set for an a-Motz-ing reveal! While Kanae tries to prepare the mansion for prospective tenants, she discovers two unique individuals in the house - and it seems one’s been living there for a while! A bespectacled man wanders Japan, leaving a strange phenomenon in his wake. Stranger yet, he seems particularly interested in finding who he calls Beethoven-senpai! Beethoven is so close to learning the secret of a nostalgic gyoza, but it comes to a halt as a mysterious “King” tries to take the classicaloids away from the Otowa mansion! The origins of the classicaloids are revealed, and just when Kanae’s at the end of her rope, the mansion is once more in danger of being demolished! The small town is besieged by a wild urban legend! Strangely, Motz is nowhere to be seen. What could be keeping the prolific pink composer away from the mansion? Liszt takes Kanae out for a "Girls' Day", starting with a CLAKLA performance. However, when the two idols join them, the "Girls' Day" becomes something a bit different. Beethoven becomes enthralled with guitars, but can’t seem to find the right one. Haunted by a vision of his past, he struggles to find the thing he’s missing. Chopin becomes enamored with a cyber-idol program, and his musik brings it to life. The others in the Otowa House get the wrong idea about what’s going on with him. As Kanae makes plans to visit her ailing uncle, she must prepare her "tenants" to take care of the house while she's gone. Motz and Beet are invited to Arkhe Corporation’s New Artist Auditions. Is Motz destined for pop stardom? Will Beet change his tune? Just what will master Bach think of it all? While singing in the bathtub, Schubert finds that he's accidentally turned himself... into a fish?! It's a good thing the residents of the mansion love fish... for lunch. A raging mad Tchaiko shows up at the mansion claiming to be done with Bada, and Kanae gets pulled as her replacement. Has Kanae found her true calling as an idol? Sosuke begs the ClassicaLoids to perform with him at the school festival, and he gets a harsh reality-check when he discovers how popular they are with his classmates. Episode 16: Work, Beet and Motz! Beet and Motz search for a perfect job with nearly disastrous results. In their absence, Chopin reveals another side of himself, and Liszt finds a new way to express love. Episode 17: Oranges! Oranges! Grilled Oranges?! Has Hasshie cursed the ClassicaLoids? A night of horror ensues as Beet-san and Schubert find themselves turning into oranges, leaving Sosuke, Chopin, and Motz to deal with it. Bach searches for musical inspiration and ends up in a compromising position. Meanwhile, Mitsuru kidnaps Sosuke (accidentally) and uses him to unleash her new creation. Kanae and the others try to survive the curse of "Swan Lake" when Tchaiko accidentally unleashes musik which makes it easier to fall in love... and then meet a tragic end. When Motz's pranks go to far, Kanae forbids him from pulling any more. However, his pent up energy might unleash something even more chaotic: a phenomena called Motz Panic! Schubert realizes that no one recognizes his existence... or his musik! In a foreign land, Schubert discovers his own beat and unleashes his frustrations on the others. Eccentric Beethoven has discovered a new obsession: creating the perfect cup of coffee. However, the path to destiny (and his "best coffee") is filled with obstacles! Bach sets his plan in motion to collect the ClassicaLoids and activate the Octave. When force fails to bring them together, Mitsuru's backup plan throws the city into chaos. The entire world has become mindless versions of Bach. It's up to Kanae, Beethoven, and Motz stop the device before the world is changed permanently. Aliens attack the Earth. When the ClassicaLoids' attempts to communicate with musik fall flat, they place the fate of the world on Kanae and Sosuke's shoulders.